Baywatch / Baewatch... Kinda the Same. Don't worry... we're not about to suggest you wear a pair of wedges to the beach. However, the red and white stripes on these espadrille sandals—along with the thick lug soles—do make one think of those old school lifesavers on every lifeguard's chair, no? The ankle strap adds a little leg-elongating magic, too. So weather you're down by the bay or hunting for bae (or heading out with someone special), these Nine West wedges have you covered. They also have a bit of patriotic appeal. Double weekend-themed win. Get them HERE (they're less than $100). 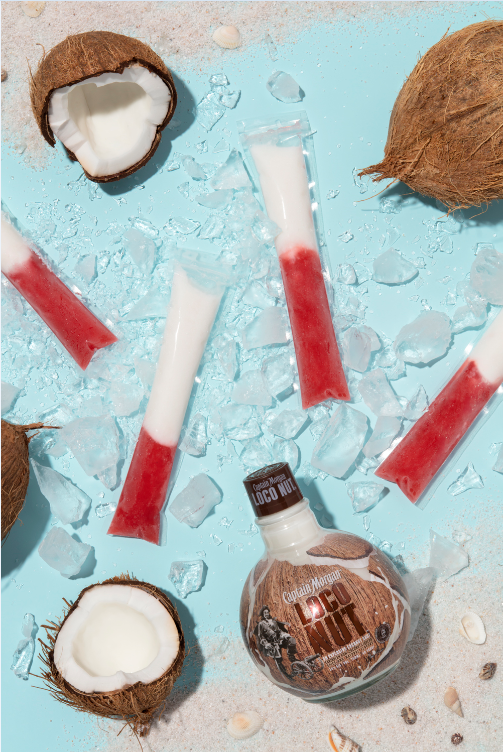 Combine LocoNut and coconut water. Stir to combine. Separately, combine Captain Morgan White Rum, strawberry daiquiri mix, and water. Stir to combine. Fill a plastic freezie sleeve halfway up with strawberry daiquiri mixture. Top with LocoNut mixture and freeze overnight before serving. If you make a batch of Red Suit Ready pops, promise to invite us to the party? Please? Seriously, though, what's on your agenda for the weekend, and what will you have on your feet? *Disclosure: Shoes N Booze is an Amazon affiliate and receives commission on products purchased by clicking its links. Captain Morgan is a product partner, and Shoes N Booze receives complimentary bottles.